What times doe the theatre open? What is my Backstage Pass loyalty number? How do I redeem my Backstage Pass loyalty offers? When will you show _____________ movie? I have a Dickinson gift card. Can I still use it? How do I apply for donations? When do tickets go on sale each week? What time does the theatre open? The theatre opens 30 minutes before the earliest advertised showtime. Ticket and concession prices vary based on location, showtime and format (IMAX, Grand Screen, 3D, Marquee Suites). For the most accurate ticket pricing, visit www.bbtheatres.com, select your local theatre from the drop down menu and scroll to the bottom of the page. Thank you for participating in our loyalty program! Your membership number is the phone number you provided at the time of your sign up. Once at the register, provide your loyalty membership number (your phone number) to the friendly employee and our point of sale software will automatically pull up the special offer(s) available to you. Our booking department works very hard with each studio to bring the very best variety of films possible to each market. Sometimes it is not possible to play more limited released options in every town. Our contracts with studios are finalized on Mondays for the coming weekend. New features and showtimes should be available no later than Tuesday afternoons. Yes! You may use Dickinson gift cards at any of the previous Dickinson locations! 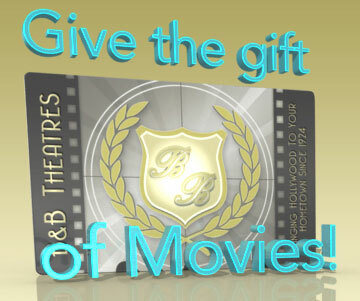 B&B gift cards may also be used at all locations! You may make your donation request at our Donations Request page. Due to high volumes, we may not be able to honor every request. New tickets go on sale each week, Monday evening by 8:00 pm (meaning, anytime prior and up to 8:00 pm at the latest). Typically, tickets gets posted between 6:00-8:00 pm on Monday, for the following Friday-Thursday. Note: for "event" films, like Star Wars, ticket pre-sales may be available and those will be posted at the advertised time. Customers must be 17 years of age or older to buy a ticket to an R rated film. Customers under the age of 17 must be accompanied into the movie by a parent or adult guardian 21+ years of age. Parents or guardians may not buy a ticket for a minor person and allow them to go into the movie unaccompanied. Customers under the age of 17 who are found to be unaccompanied in an R rated feature will be escorted off the property without a refund. Children 6 and under are not permitted in an R rated feature after 6 p.m.
A government issued ID (Driver's License, State ID, Military ID) with a photo and a date of birth is required when purchasing an R-rated ticket.